Menu navigation is simple and easy to navigate. 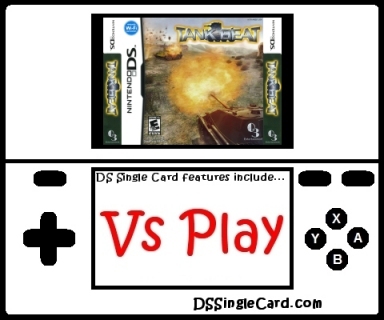 "Battle Mode" is right on the main menu, followed by "DS Wireless Play" and then "DS Download Play" to begin. The opening credits were a little longer than average, but are partially skippable. Download time was longer than other, similar games. The menu consists of several large, clearly defined (and clearly labeled) buttons separated by a sufficient amount of buffer space. While the basic controls of the game (draw a path to move, hold a button and double-tap to shoot) seem simple enough, they are not consistent enough to be reliable. Lines are difficult to draw in straight lines when you want them in straight lines, but crooked lines draw easily. Equally as frustrating is the fact that players cannot retrace their line and redraw. Instead, they must stop drawing, stop their tank from moving, and then redraw the line, hoping to get it right. Shooting is even less reliable, with multi-taps changing the aim (which cannot be locked in) before they fire the weapon. The game's look is very dark in color, and is sometimes hard to see. The tanks can sometimes be hard to see up against buildings as a result. The graphics themselves aren't bad -- the game is three years old (two in the U.S., but three if you take it's original Japanese release into account), and it shows, but they were otherwise on par with games of the time. Sound is necessary, if only to let you know when your weapon(s) are ready to fire again (otherwise, there will be a lot of unsuccessful tapping). The lack of options, however, is all but crippling - specificly, the inability to change the three minute time limit, which is barely enough time to do anything, considering the speed of the tanks and the size of the stage. The are no tank options, there are no weapon options, and there are no stage options. Tank Beat started with a great concept - tank deathmatch battling - and it all went dowhill from there (see everywhere above and below). The basics of a good game are there in the concept and controls, but then the graphics and lack of options killed the concept and the controls (faulty in their own right) can't help at all. Starting out, I was hoping for a hidden gem, a game that slipped through the cracks, or whose Single-Card Download gameplay was the best part. Even if that's the case, the only sparkle here was snuffed out prior to the game shipping. A sequel does exist and I'm actually looking forward to it. I'm hoping that the concept stays strong and that learning (on the developer's side) helps everything else catch up. Until I have a chance to review it here (it also has Single-Card Download), I can't in any good conscious recommend Tank Beat as a good game. I can recommend it to developers as a concept that should be explored more, and in more depth, but otherwise I recommend waiting and I'll update you if/when I acquire the sequel (Heavy Armor Brigade). Add the ability to backtrack along drawn lines to redraw. Allow players the ability to lock onto targets. Offer a button-controlled option for shooting. Change the touch-controlled shooting mechanism to shoot with a single tap on a target. Brighten up the colors and have a greater contrast between the tanks and the buildings, etc. Let players change the time limit, or turn the time limit off altogether (in favor of a to-the-death ending). Provide choices (pre-download if necessary) for multiple tanks, weapons, and stages.